Woolzies Dryer Balls are an eco-friendly alternative to fabric softener and dryer sheets. Hand-made from 100% wool, Woolzies can reduce static and drying time by up to 25%. They don't cause buildup in your clothing like traditional fabric softener, thereby extending the life of your clothes. Check out a recent review of this great product. 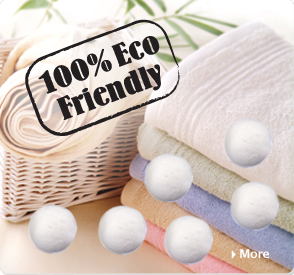 As part of our grand prize giveaway, Woolzies is giving our lucky winner a set of Woolzies Dryer Balls! This 6-pack retails for $35.99, but can be yours by entering here.